Nepal is a country of 22 million people that lies between India and Tibet (China). Its extreme geography varies from tropical forests to snowy Himalaya, but this magnificent landscape is also a major impediment to development. Nepal ranks as one of the 20 poorest countries in the world, with high rates of maternal and child mortality, and low rates of literacy. Most people are farmers and over 90% practice Hinduism. The quality of life in Nepal has further deteriorated since a Maoist insurgency began fighting the government in 1996. The United Mission to Nepal (UMN) was established in 1954 to minister to the needs of the people of Nepal in the name and spirit of Jesus Christ. About 150 missionaries from 20 different countries work for UMN in the fields of health, industrial development, education, and rural development. UMN is currently undergoing a change process, and will eventually turn over direct governance of its institutions to local Nepalese organizations. We expect that foreign missionaries will continue to work on these projects. 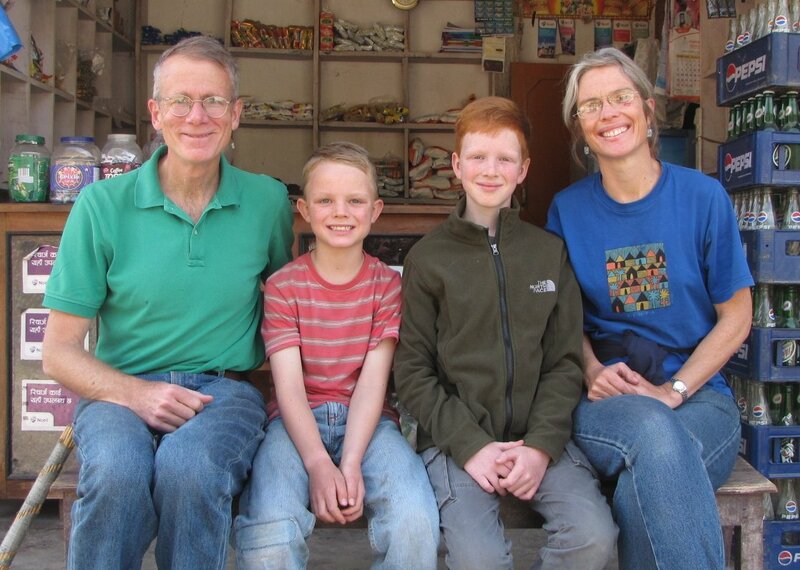 United Methodist Missionaries Mark and Deirdre Zimmerman and Their Family. Mark has worked in Nepal as a doctor of internal medicine, and as also served as medical director of Patan Hospital for a time. He most recently served as Director of the Nick Simons Institute (NSI), where he worked to develop and train doctors and medical personnel throughout all of Nepal. Mark recently left NSI and has returned to Patan Hospital to practice medicine once again. Deirdre worked in Nepal as a community nutritionist from 1997 to 2002, and is addition to being a housewife looking after their sons, is involved with the Nutrition Promotion and Consultancy Service. NPCS works to develop training and educational programs to teach the people of Nepal about proper nutrition and hygiene. Zachary was born in 2002 in Patan Hospital's Birthing Center, and serves as the family's ambassador-at-large. The newest addition to the Zimmerman family, Benjamin, was born in 2004. While in Nepal, they are administratively responsible to UMN. They are sent to Nepal by General Board of Global Ministries of The United Methodist Church (USA). They have support churches in Pennsylvania, New York, Delaware, Ohio, West Virginia, Vermont, New Hampshire and Maine - as well as in Ireland and Northern Ireland. They need a lot of prayer! How Can Someone in America Help? For the future of Nepal, that the people of that troubled place would discover hope. Let them come to know the love of Jesus Christ for each of them. For the future governance of UMN's hospitals as it changes. We are hoping to create or link with a local Christian organization that will share our commitment for these hospitals. For Patan Hospital's early work in establishing a medical school. This may eventually produce 40 new Nepalese doctors a year.